We’ve both been on the road this week, so not a lot of blogging time. The hilarious thing is that we both went to Canberra for work, separately. We overlapped a night – had some pretty good Moroccan pizza on ‘date night’. But, other than that, they were separate trips. Separate cars. Separate hotels. (Separate expense accounts…). 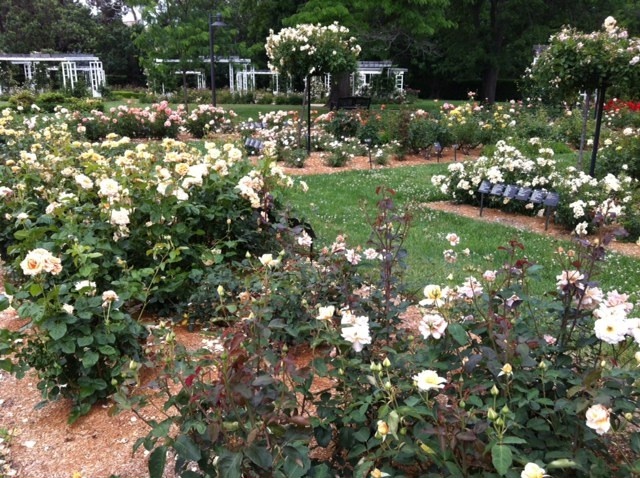 The rose garden at the old Parliament building is very impressive. It isn't huge, but big enough to piss off all our Canadian friends and family who are now getting snowed on. Canberra is the capital of Australia. It is a manufactured city…here are some details from Wikipedia: “With a population of over 345,000, it is Australia’s largest inland city and the eighth-largest city overall. The city is located at the northern end of the Australian Capital Territory (ACT), 280 km (170 mi) south-west of Sydney, and 660 km (410 mi) north-east of Melbourne. The site of Canberra was selected for the location of the nation’s capital in 1908 as a compromise between rivals Sydney and Melbourne, Australia’s two largest cities. It is unusual among Australian cities, being an entirely planned city. Following an international contest for the city’s design, a blueprint by the Chicago architects Walter Burley Griffin and Marion Mahony Griffin was selected and construction commenced in 1913.The Griffins’ plan featured geometric motifs such as circles, hexagons and triangles, and was centred around axes aligned with significant topographical landmarks in the Australian Capital Territory.” It is a pretty cool city. It seems that many Australians hate it…but then again, we know some who love it. It might just be that, like with Ottawa, those opposed to the government can’t separate the city from what happens there. 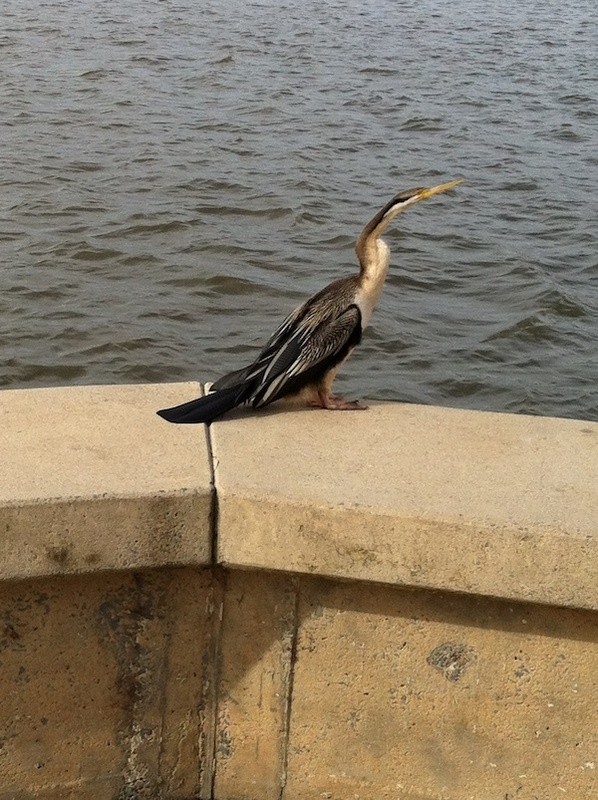 Lisa got to meet an Australian radio celebrity, but Dan got to see an anhinga novaehollandia. That descriptor of it being between Sydney and Melbourne means that it is about a 2 and a 1/2 hour drive from Wagga. Dan went on Monday morning and had a few hours to walk around in the afternoon to see it. He was very disappointed that he didn’t take his bicycle – the CSU vehicle he was assigned was a huge Ford SUV and it would have easily fit in the back – because Canberra is a cycling city. It is flat and there are bike lanes and trails everywhere. Lake Burley Griffin has about 30 km of trails around it. He decided that because it is so close, we are going to some day soon strap the bikes on the roof, drive down, circumnavigate the lake, then stop in Murrumbateman for lunch on the way home. Great plan for a Saturday or Sunday morning. No, that isn't Bruce Dickinson she is talking to unfortunately. But what other bloggers have had a reason to link to two Iron Maiden videos in one week? Lisa went on Wednesday; she had a bunch of meetings and was also giving a public talk at the National Library of Australia. In the afternoon, she got a call from the CSU media people (who had put out a press release about her talk) that her presence was requested at ABC (Australian Broadcasting Corporation) radio in Canberra (Canadians: think CBC; Americans: NPR but not hated!). So she ended up doing an interview on the afternoon drive program with Louise Maher on ABC 666. And no, unfortunately this isn’t an ‘all Iron Maiden, all the time‘ radio station…it just happens to be the call sign of the Canberra station. Damn. We managed to get together for dinner that night, then the next day (Thursday) Lisa went to her meetings, did her talk at the library, etc., and Dan went home. Dan’s trip home was actually pretty interesting though. Just north of Canberra is a small town called Murrumbateman. For a variety of reasons that we won’t bore you with (though we could…Dan heard all about it) it is an amazing location for growing grapes…and what does that mean in Australia but making wine. 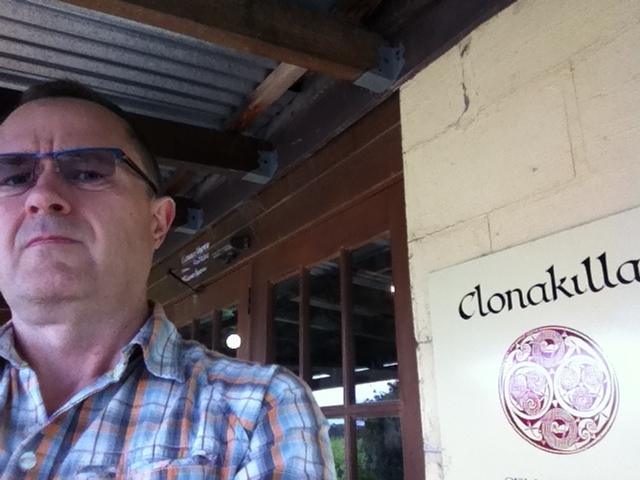 He stopped at Clonakilla, which is regarded as one of the country’s best wineries. It is pretty small, and makes amazing wines. As he was driving, he only sampled a couple of them, and because we are well stocked after the trips to Corowa/Rutherglen and Young, he also held back on buying too much. But he couldn’t resist a couple bottles from what is known as the premier producer of shiraz and viognier on the island. A darter and one of the top wineries in the country. Dan thinks that is far better than being on national radio and speaking at the national library. That's why Lisa is a Professor, and he's support staff. Then, about half way home, he saw a sign for the Jugiong Wine Cellar. Since it was just a short detour off the highway, he went to the tiny town of Jugiong, but discovered a great place. The Wine Cellar is basically a shed that sells local wines, from within about 50 km, so including Murrumbatemen, Young, Tumbarumba, Gundagai, etc. And given the geography and climate here, those distances matter in terms of how much rain and sun you get, soil types, etc. This makes a huge difference – the wine-making apprentice at Clonakilla (he’s a CSU wine student) explained to Dan that they source grapes from a reclaimed quarry, and the sun and soil are so different top than at the bottom that depending on how much rain and how many hot days they have to carefully work out how many upper and how many lower grapes go into each vat for crushing (Lisa here: who cares!). And there is a fruit stand, a pub, and a cafe/deli/cooking school. That is Jugiong. But really, what more do you need! We will be going back soon. We’ve discovered a fantastic hidden gem of rural Australia. And, though he didn’t meet her, the owner of the Wine Cellar said she has an employee from Red Deer! Wow! Hopefully when we go back – there were some interesting wines there, and only available there, so we will be going back – we will get to meet her. And then the week continued…Lisa in meetings in Canberra, Dan back in the office in Wagga. And if you are wondering about the title of this post: enjoy! This entry was posted in birds, Canberra, Clonakilla, cycling, Hilltops, Jugiong, Murrumbateman, wine, wineries. Bookmark the permalink. -The crossed out bit was terribly interesting. -This “Clash” band on YouTube just might make it.